Many people are interested in finding out the truth about garcinia cambogia because of conflicting reviews about its health benefits. Many scientific studies indicate that garcinia cambogia supplements help to lose weight and reduce body fat. There are also claims that garcinia cambogia extracts are beneficial in lowering cholesterol and regulating blood sugar levels. However, some research into the effect of garcinia cambogia on health indicates that it could affect liver function. Using garcinia cambogia for weight loss became popular when Dr. Oz endorsed it as a weight loss supplement. The evidence was based on the fact that garcinia cambogia contains hydroxycitric acid (HCA). This compound helps a person feel fuller for longer and also reduces lipids (a type of fat in the blood). In this article, I aim to find out the truth about garcinia cambogia and find out if there are any side effects of taking this supplement. You will also find out how to use garcinia cambogia together with apple cider vinegar to help speed up weight loss. Garcinia cambogia is also called garcinia gummi-gutta, Malabar tamarind, garcinia, or brindle berry. What Dr. Oz Said About Garcinia Cambogia And Weight Loss? In 2012, on his popular TV show, Dr. Oz proclaimed that garcinia cambogia was the “holy grail of fat loss.” He said that it was possible to use this natural supplement as a “fat buster” and a person could lose weight without the need of diet, exercise, or effort. Dr. Oz based his claims on research that pure garcinia cambogia pills suppress appetite and help the body burn fat faster. However, skeptics point to other studies that show the effect of garcinia cambogia extracts is only minimal on weight loss. This has led many people to question if there is any truth about the effectiveness of garcinia cambogia for weight loss. Let’s look at what recent research has revealed about the use of garcinia cambogia as a weight-loss supplement. Does garcinia cambogia work as a weight loss supplement that shows results in a short period of time? First, it’s good to remember that no weight-loss supplement, including garcinia cambogia, will show results after a week. However, what does scientific research reveal as to taking garcinia cambogia to shed excess pounds quickly? So, what do users of garcinia cambogia say when posting online reviews of this weight-loss supplement? 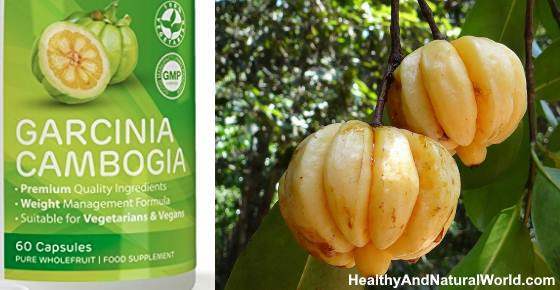 A popular garcinia cambogia supplement that contains 95% HCA (750mg garcinia cambogia extract) per capsule had over 4,500 customer reviews. Many users commented that the supplement helped with steady weight loss when used alongside a healthy eating program and exercise. Others said that the supplement helped suppress appetite. However, a few noted that digestive upset was a side effect of garcinia cambogia. In another product, most users reported that they felt less need to snack between meals and that their energy levels were up. However, a small percentage of users said that they felt no effect on weight loss after using garcinia cambogia for 4 weeks. Interestingly, many reviews commented that a combination of garcinia cambogia and apple cider vinegar for weight loss worked for them. Can Garcinia Cambogia Reduce Belly Fat? One of the benefits of garcinia cambogia is that it can also help reduce belly fat and visceral fat. When using garcinia cambogia to lose weight effectively, you may also notice that garcinia cambogia results in many other health benefits. One of the benefits of taking garcinia cambogia supplements is that it will help lower LDL cholesterol naturally. Garcinia cambogia weight-loss pills can also result in improved blood glucose readings and less insulin resistance. Because of its overall beneficial effect on reducing lipids, cholesterol, and insulin resistance, garcinia cambogia can also help boost your heart’s health. The Bottom Line: Does Garcinia Cambogia Work? From many studies into its benefits, it would seem that taking garcinia cambogia works for many people. Recent studies have shown that it can help reduce feelings of hunger, improve blood work, and help reduce visceral and body fat. As with any natural supplement, it may not work for everyone. Some short clinical studies have only shown modest results. Also, garcinia cambogia reviews, although generally positive, mention that some have not found it effective as a weight-loss supplement. How Do You Take Garcinia Cambogia for Weight Loss? Most manufacturers recommend taking garcinia cambogia for weight loss twice a day. It is usually recommended to take one capsule about 30 minutes before your breakfast and 30 minutes before your evening meal. What Is the Right Garcinia Cambogia Dosage for Effective Weight Loss? Different manufacturers recommend various doses to help lose weight quicker. Some supplements are high-dose capsules with about 1,000 mg garcinia cambogia in each capsule. It is also important to check the amount of HCA that each capsule contains. Most of the controversy associated with side effects of garcinia cambogia are to do with its effect on the liver. Some people have had adverse liver conditions after using supplements containing HCA. So is garcinia cambogia safe to use? Also, it wasn’t taken into account if any who suffered side effect of garcinia cambogia had pre-existing liver conditions. Most of the reported garcinia cambogia side effects are related gastrointestinal issues like stomach cramping, diarrhea, or nausea. Some users’ reviews online report conditions like abdominal cramping, nausea, and passing watery stools. Other side effects. Some people who take garcinia cambogia report side effects like dry mouth, frequent headaches, or dizziness. Interaction with medicines. If you are taking certain medications, you should avoid taking HCA garcinia for weight loss. Some medications that garcinia cambogia can interact with include diabetes medication, cholesterol-lowering drugs (statins), blood-thinning medications, and allergy medication. As this article has shown, many scientific studies into the benefits of garcinia cambogia have shown it to be effective as part of a weight-loss program. However, some people have reported some side effects when using HCA supplements. So, is garcinia cambogia safe to use? What Brand of Garcinia Cambogia Should You Buy? When searching online for the best HCA weight-loss supplements to buy, it can be very confusing to know which brands of garcinia cambogia really work. First, it’s important to read beyond the marketing hype and see what is in the capsules and how users rate the product. Here is a short guide to buying the best garcinia supplements. Reputation. Look at the reputation of the brand selling garcinia cambogia pills. For example, is the product also available to buy in health shops? Or, can you only buy it online? Usually, “bricks-and-mortar” stores have to be more stringent with what they sell. HCA content. The reason that garcinia cambogia works for weight loss is that it contains HCA. So, check the percentage of HCA in each capsule. You should look for supplements containing at least 60% HCA. Other ingredients. Also, check the list of other ingredients. Some garcinia weight-loss supplements are a combination of natural ingredients. Others contain unnecessary fillers and it’s even been reported that some “natural” supplements have “prescription-only” medicine in them! Be careful if ingredient names are difficult to pronounce. Reviews. Also, check out what other users’ reviews of garcinia cambogia are saying about the particular product. For example, do the majority of users report a good effect on reducing satiety and helping to boost weight loss? Or, do many complain of digestive upset when using that specific brand? Garcinia Cambogia and Apple Cider Vinegar – Can It Help You Lose Weight? To help make losing weight easier and quicker, you may want to try the apple cider vinegar diet with garcinia cambogia. Apple cider vinegar contains high levels of acetic acid and can help to lose weight. You can combine the weight-loss effect of apple cider vinegar and garcinia cambogia. For this, you will need raw, organic apple cider vinegar (e.g., Bragg’s apple cider vinegar is a popular choice) and high-quality garcinia cambogia supplements that provide 1,500 mg per day. Mix 1 tablespoon apple cider vinegar in an 8 oz. glass of water. Take one garcinia cambogia capsule and swallow with the glass of diluted apple cider vinegar. Take in the morning 30 minutes before breakfast and in the evening 30 minutes before your meal. If you need to take 3 garcinia cambogia capsules to reach the recommended dose of 1,500 mg per day, take one capsule 30 minutes before lunch with a glass of water.